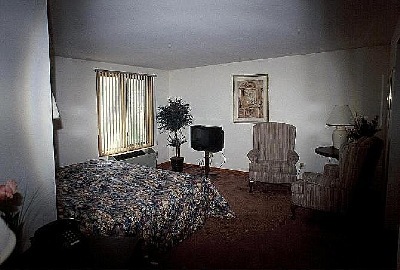 Our King Suite, located on second floor, is a large room with a bar and stools, sky-light, king size bed, 32"flatscreen TV with remote, and 2 lounge chairs. The large window overlooks the sub-division behind the Inn. You will feel that you are in a private home instead of a hotel. Relax in comfort in plush lounge chairs.